If you’re looking for a well-built gas grill to sizzle your steaks and serve up perfectly charred hamburgers, the Weber Spirit E210 is our top pick for a gas grill. The Weber Spirit E210 offers two burners with an output of 26,500 BTUs per hour — which is enough to generate temperatures of at least 500 to 600 degrees, users report. The cooking surface area is 360 square inches, with another 90 square inches as a warming area. This is enough to grill at least a half-dozen burger patties, plus a few ears of corn on the cob. It may not be enough space to grill up a barbeque feast for a crowd all at once, but for everyday use and small get-togethers, the Weber Spirit fits the bill. People love the compact construction and high-quality materials used in the Spirit E210. The cooking grates are cast iron, with a porcelain enamel finish. This makes them good conductors of heat, but easier to clean than uncoated cast iron grates. The Spirit has a smaller footprint than some gas grills but offers two stainless steel side tables perfect for prep work or serving. The Weber Spirit E210 is consistently described as the best grill ever, and though it is not the most full-featured grill on the market it is well-built and performs great season after season. The Weber Performer Deluxe Charcoal Grill takes the art that is charcoal grilling and makes it simpler and faster. The Performer Deluxe model of Weber’s charcoal grills costs more than its classic but basic original kettle grill. But for the extra cost, you’ll get a generously-sized work table, charcoal storage bin, one-touch cleaning system, lid-holder and gas-assisted ignition. Most people purchase this grill for the gas assist, but the other features are a nice addition as well. The gas-assisted ignition means that the coals can be lit and heating to temperature within about five minutes. This saves the hassle of lighter fluid, newspaper, and waiting as you work to light and heat the coals. Both avid and casual charcoal grillers love the performance of this grill and comment on the usefulness of the side table and lid holder while grilling. The lid holder has saved many of the lids from being dropped on the ground and suffering dents and dings. Most people agree that the premium paid for the features of the Weber Performer Deluxe Charcoal Grill seems steep but quickly becomes worthwhile with the easy, hassle-free grilling offered by this model. If cooking for a crowd is the name of your grill game, then you need a supersized gas grill like the Genesis II LX S-640 6-Burner model from Weber. This gas grill is available in both propane and natural gas configurations. With the ability to produce 72,000 BTUs per hour and almost 1,000 square inches of cooking area under the hood, there is more than enough room on this 6-burner gas grill to feed a crowd. The primary cooking area measures 770 square inches, while the warming rack adds an additional 228 square inches. All grates are made of durable and long-lasting stainless steel. This grill is a real crowd pleaser, and you can cook up to 38 burger patties at once. Will you need to cook that quantity every weekend? Probably not. But as one grill master pointed out, the ability to have such a large work area makes it easier to cook up a variety of tasty dishes. Plus, the Genesis II LX S-640 features a 12,000 BTU side burner where you can prepare other side dishes. Interestingly, the Genesis II LX is one of the few Weber gas grills still made in the United States — which some people credit for the grills excellent quality and workmanship. If you’re a self-proclaimed grill king, you need the crown jewel of gas grills — like the Summit S-470 from Weber. This stunner of a gas grill gleams in stainless steel or looks elegant in black porcelain. It’s available in both propane and natural gas configurations, and each burner features individual Snap-Jet ignition. The S-470 model is perfect for the needs of most grill gurus. It has 4 burners that produce 48,800 BTUs per hour, and a primary cooking area of 468 square inches with an additional 112 square inch warming rack. The cooking grates are made of heavy-duty stainless steel. Additionally, the grill has a dedicated sear station that will turn out beautiful steaks finished to perfection. The Summit also includes the versatile components that true grilling enthusiasts will enjoy experimenting with, including a tuck-away rotisserie and an integrated smoker box. Smart features like LED-illuminated burner knobs and a handle with built-in light make it easy to grill at night according to users. This grill is a splurge, but it receives praise and rave reviews thanks to its functionality, high-quality construction, and superior grilling abilities. If you’re serious about grilling, you seriously need to purchase the Summit S-470 4-Burner Gas Grill. Want to take your grilling game on the go? The Jumbo Joe 18-inch Portable Grill is the perfect portable grill. This grill uses charcoal and is made for travel. It features a metal bracket that keeps the lid locked in place during transit — and holds it in place during cooking, also. The Jumbo Joe is the larger of the two portable grills made by Weber, and it wins out thanks to its stainless steel cooking grates and larger 240 square inch surface area. People love the quality construction and ventilation available on the Jumbo Joe Portable Grill. It makes a great camping companion or take it along for tailgating. You’ll have plenty of room for grilling for yourself and several friends. The only thing to keep in mind is that there is plenty of clearance under the lid for items like burgers and hot dogs, but not as much room to cook bone-in turkey breast or whole chickens. Chances are pretty good though that this portable grill is capable of handling anything you have in mind for a park adventure or game day cookout. Get ready for grilling on the go by purchasing the Jumbo Joe 18-inch Portable Grill. For a no-frills, classic grilling experience, the Original Kettle 18-inch Charcoal Grill is a popular choice. This familiar charcoal grill has been a fixture in backyards and patios for decades. With a porcelain-enameled bowl and lid for heat retention and 240 square inches of cooking space, you can make everything from brats and burgers to chicken and steaks — just maybe not all at once! The cooking grate is plated steel instead of cast iron, and it lacks a hinge for tending to the coals while food is on the grate. Even still, this grill is a favorite of casual grillers and charcoal enthusiasts thanks to it’s straight-forward operation and affordable price. 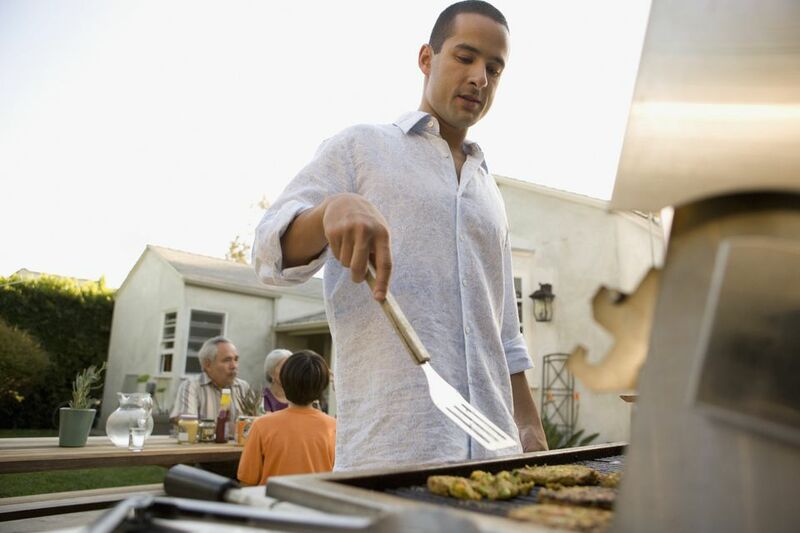 People find that it’s the perfect size when grilling for two to four people, and it keeps coals hot for hours. So if a basic charcoal grill is what you’re looking for and you’re not cooking for a crowd, the Weber Original 18-inch Kettle is the way to go.